For nearly a year, the Obama Administration -- aided by many in the media -- have sought to distract from Cuba's repressive realities by painting it as a land of salsa, cigar and mojitos. Thus, when news broke of a Cuban military presence in Syria, in support of Bashar al-Assad and Putin -- they've been scratching their heads. Why would Castro do that? It's similar to how they sought to ignore or whitewash Castro'ssmuggling of 240 tons of weapons to North Korea in 2013 -- the largest violation of U.N. international sanctions to date -- or Castro'ssmuggling of Chinese weapons through Colombia in February of this year, which nobody seems to know who they were destined for (hint:FARC narco-terrorists). - Major event in Damascus hosted by the Syria-Cuba Friendship Association at the Regional Leadership of al-Baath Arab Socialist Party on the occasion of the 50th anniversary of the establishment of diplomatic relations between the two countries (September 2015). - Russian intelligence ship, Yantar, targeted a U.S. nuclear missile submarine base and underwater transit routes off the eastern seaboard, as it headed for safe-harbor in Cuba. Throughout the year, the Castro regime has continued to host and harbor Russian spy ships tasked with monitoring sensitive U.S. defense networks (September 2015). - A group of senior Syrian regime officials, led by the Secretary General of Assad's Baathist Party, Hilal al-Hilal, traveled to Havana to visit with the Castro regime. Al-Hilal stressed how the current U.S.-Cuba negotiations have taught Assad's regime "to continue resisting in our war, in the same manner as the Cubans have triumphed in their war against imperialism" (May 2015). - As Russia restores military-industrial cooperation with Cuba, it may soon reopen the Lourdes signal intelligence center near Havana,announced a senior member of the State Duma Security Committee (May 2015). 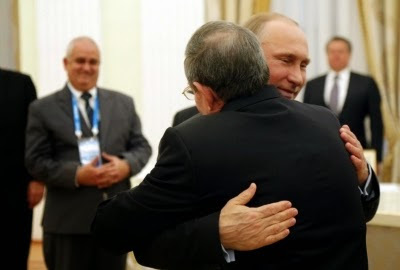 - Cuban dictator Raul Castro visited his "dear friend Putin" in Moscow (May 2015). - "We intend to continue cooperation in supplying the Cuban Revolutionary Armed Forces with modern weapons and military hardware," Russian Defense Minister Sergey Shoigu said at a meeting in Moscow with Deputy Chairman of the Council of Ministers of Cuba Ricardo Cabrisas (April 2015). - A Russian spy ship, The Viktor Leonov, returned to the Port of Havana during a visit by European Union's foreign policy chief, Federica Mogherini. Her visit to Cuba also "coincided" with a visit by Russian Foreign Minister Sergey Lavrov. "I am absolutely convinced that nothing threatens our close, partner and strategic relations with Cuba. We see no signs that someday everything will be different," Lavrov stated (April 2015). - A Russian spy ship docked in central Havana on the eve of a visit to Cuba by the first U.S. delegation for "normalization" talks. The Viktor Leonov, an armed intelligence-gathering vessel that monitors US communications, arrived at a passenger cruise terminal in full public view for what a Russian embassy official called a “friendly” three-day stay (January 2015). - Assad's terrorist allies, Hezbollah, celebrated Obama's new policy towards Cuba. “The achievements of Cuba, which was firm on its principles, is a lesson for all people of the world who are suffering from American hegemony,” Hezbollah official Ammar Moussawi said after a meeting with the Cuban ambassador to Lebanon (December 2014). - Cuba led an effort (along with Algeria, China, Russia and Venezuela)to protect Syria's Bashar al-Assad from a U.N. human rights inquiry for crimes against humanity (September 2014).